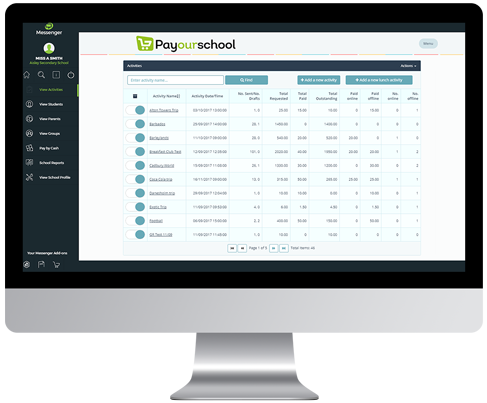 Payments by Cash is a feature that allows you to register a payment made offline by cash or cheque against an activity. The reality of parental payments means that some parents/guardians may need to pay for activities using cash or cheque, rather than providing an online payment. 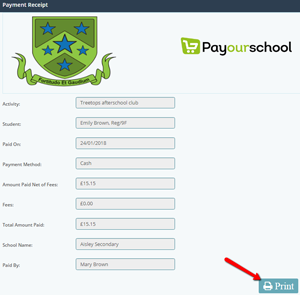 1) To pay for an activity by cash or cheque, click Payments by Cash from the Menu at the top of the page. 2) From the Students panel on the left, type in at least the first 3 letters of a student’s surname and click Search. 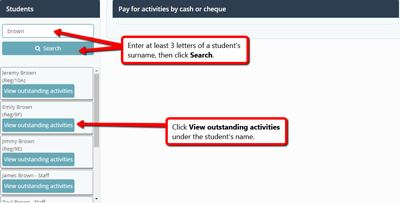 a. Scroll down to locate the student and click View outstanding activities under their name. 1) Under the Pay now? column, toggle Yes next to the payment you need to update. 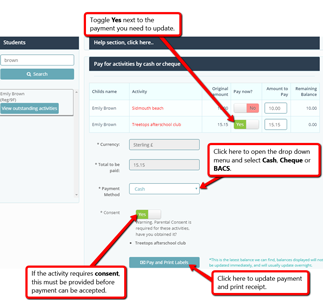 2) From the options underneath, click on the Payment Method drop down menu to choose from: Cash, Cheque or BACS. 3) If the activity requires consent, you will need to obtain this before collecting payment. If you have received consent, just toggle this field to Yes. 4) Click Pay and Print Labels.